Poetry, music, and art – Oh, my! – Ce Soir Arts – Be inspired tonight! Poetry, music, and art – Oh, my! NEXT, on WEDNESDAY…the bad news came that DONN DEVORE was feeling a bit under the weather. Donn rocks the Castle every-other-week, and we always look forward to it, so we were – as you can imagine – quite disappointed. However, the health and well-being of all who come to Ce Soir is of the utmost importance. And so, as we were chatting with Sher Salmson (Donn‘s manager from SpiritFire Entertainment), she presented an idea: have ACOUSTICENERGY (AE) step in for Donn. Now, there was an idea we could get behind! Fortunately, he was free and he popped on over and took the place by storm! It was a great show, and although we still want Donn on the docket, we’re going to find a spot for AE to come round now and again as well. Thank you, AE – outstanding! Up next – the man who is a party on wheels: ALEX MAYS. Now, this guy knows his way around the blues, baby! We’ve sort-of cabbaged onto him for this slot in the every-other-Wednesday-night crew, and we think it’s a perfect match! ALEX really had us going with those endless guitar riffs and sultry vocals (I guess a guy can be sultry – I don’t know what other word to use that would do justice to the smooth-with-and-edge kind of thing he has goin’ on) – and that last song was a HOOOT! He’s another of those creatives that always has a new trick (or 10) up his sleeve, and it’s always a fun ride! THEN…as if that were not enough…we topped off the evening in grand style with MUSIC LEGEND IN HIS OWN TIME: TUKSO OKEY! Wow. Talk about creative! Geeeezzzz….! Every song is an adventure with Tukso, and that night he had some really cool instruments going. He is a one-man band – and master of the looper and, well, everything musical. There was some outstanding acoustic guitar going there, and those LYRICS! WOOTS! We were dancing and groovin’ throughout the hour and were sad to see the clock strike 8, but we sure wrapped on a fine note with Tukso. The Castle was happy, and so was everyone in it! AE, ALEX, and TUKSO Rocked the Castle! 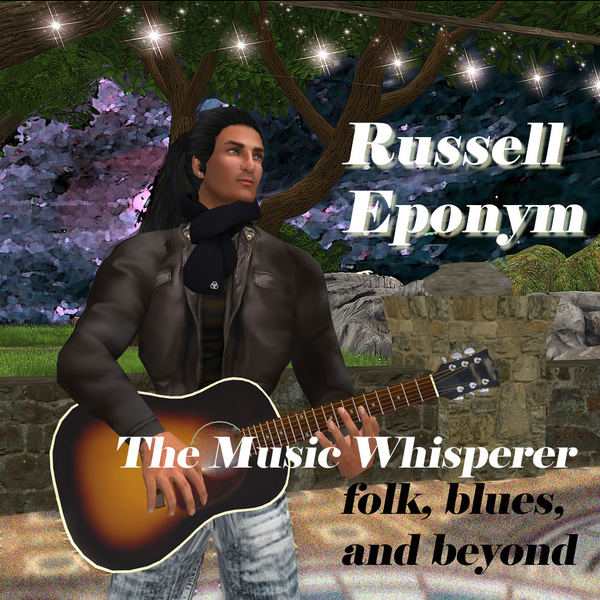 Thursday brought RUSSELL back, but this time to croon his way through an hour of great music in that mix we all love: “folk, blues, and beyond!” Only Russell does what he does: gorgeous guitar stylings with intricate finger-picking and smooth vocals that melt your heart or get you giggling! I mean, NO ONE can “galumph” the way Russell can – except that we’re all catching on to it and galumphing right alongside him into the “borogroves!” Lewis Carroll set to music: deeeeelightful! And then, there are those romantic ballads and time-honoured folk tunes we all enjoy – Eponymous Family members and new folks alike. Let me tell you, when Russell starts up with “Who Knows Where the Time Goes” or “Will Ye Go, Lassie?” – pass round the tissues. And if he sings “Danny Boy,” well…even I get teary-eyed. There’s nothing like it! And then…topping off the night in his usual CHILLAX style, was The Sound Jeweler, MOSHANG ZHAO. We had a spot of trouble logging in, so I was late and Mireille – bless her! – didn’t make it in at all. However, MOSHANG was cool (pun intended! ), and started off on time. When I arrived, a great group had gathered and were groovin’ to the sounds, as usual. What striking music this is! We just ease right on into it and get spirited away by its smoothness and power. On a deeper listen, there’s a lot going on! Traditional tunes intertwine with modern electronic sounds to make a unique and more than pleasing blend. 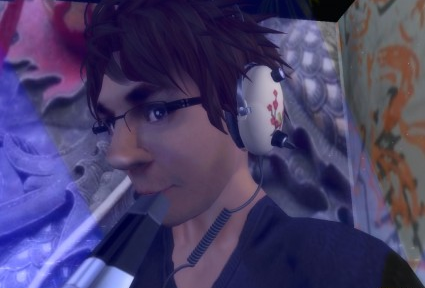 Come round next Thursday to enjoy with us – 8 PM SLT! Well, folks, that was the week that was! Next up: DRAGONFLY and TWINGHOST on Sunday night…WOWZA! And check the next post for a special invitation to come immerse yourself in some truly exceptional art from FAE VARRIALE, Ce Soir‘s Artist-in-Residence for May 2013. Her work will enthrall you with its mystical quality and sensitive use of colour and light. Pop round to the Ce Soir Arts Gallery to see just what I mean!